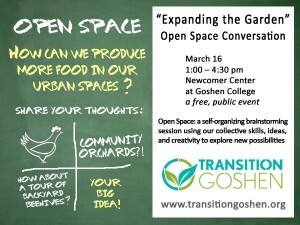 On Saturday, March 16, 2013, Transition Goshen hosted an Open Space event titled “Expanding the Garden”. During the event various groups formed to discuss a variety of topics related to the question “How can we produce more food in our urban spaces?. After the event groups were invited to share notes from their discussions. The notes were combined with a variety of photos, videos, tweets and other social media to document the event.